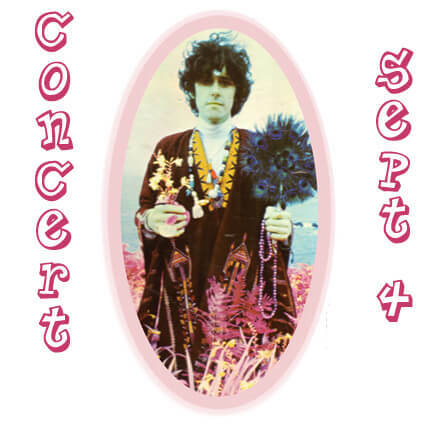 Between the balmy, carefree beats of the Beach Boys and the edgier introspection of the Beatles, showing less grit than Dylan and more mysticism than the Rolling Stones, Donovan Leitch, known simply as “Donovan”, bounded to the top of the charts in the mid-1960s. With iconic hits such as “Sunshine Superman,” “Mellow Yellow,” “Hurdy Gurdy Man,” “Catch the Wind,” “Atlantis,” and “Season of the Witch,” Donovan led more than one generation to metaphysics-as-music and music-as-mystical musings. His strong anti-war stance and embrace of Transcendental Meditation made him the epitome of peace, love and elevated consciousness. Donovan was rock royalty, shepherding the Beatles and Hollywood illuminati to India to study the ancient traditions of awareness long before “yoga” was an everyday word in America. Trained as a classical musician with roots as deep as the ages, Donovan gathered legendary musicians to play on his records in the ‘60s. Led Zeppelin first played together as studio musicians on his “Hurdy Gurdy” sessions. Jeff Beck and Jimmy Page were regulars on his hits. But as popular as Donovan became, he remained true to the thread of healing energy that wove through the fabric of his music. Years ago, Heartland Healing interviewed Donovan about the power of music as an agent of healing. Updated portions follow. Catching the Wind One characteristic of Donovan’s music associated with healing is his use of breath and vibrato. Donovan noted that other musicians have their own particular pulse and way of using vibrato. “Neil Young has a real slow one, his own particular one,” he told me. “Phoebe Snow had a fast one. My one is of a particular speed, one I would just describe as a soothing feeling. A lot of people thought it was [an electronic] tremolo coming through a guitar amplifier. It isn’t. “The effect of the way I sing, I found I could move the air in certain ways. I found this naturally and only later did I read about it and found that it actually once upon a time was taught in ancient Celtic days as part of the teachings of poetry and how to sing. A fascinating subject. “The trip to India was to rediscover what mantras and meditation techniques had been taken out of the Christian background that I grew up with. I knew there had to be something. The rich, northern European culture that existed before Christianity had it. But where did it go? I knew that the Celtic thing was important. They burned a lot of manuscripts but a few survived. The Celtic bardic tradition is passed on in oral fashion. “When the Druids and bards ended, — and by the way, there were schools of Bardic poetry in 17th century Scotland, hidden schools — what was lost? Where was that meditation? Where was that healing? Then I realized it was in the music, in the story telling. It was actually projected through story, poetry and song. Donovan said that voice and music are related in the tradition of healing. Sound, even that projected vocally by actors and orators, is in keeping with that. “The power of speech remains a part of Celtic tradition. Lennon, McCartney are Celtic names. They come from Irish descent. The powerful actors Sean Connery and Richard Harris, the power of oratory and poetry with Joyce, Yeats, Seamus Heaney — all are examples. Chakra Tones An Eastern aspect many yoga practitioners recognize is the presence of energy centers at areas of the body called chakras. There are seven main ones. Donovan told me certain sounds relate to the varied chakras. He cited the famous sons of Shenandoah, Iowa: the Everly Brothers.